Today I am sharing my first of several cards showcasing this month’s Stamp of the Month set. This set is only $5 with a purchase of $50 or more. Of course to sweeten the pot, I will be sharing several free cutting files with you if you purchase the stamp set through my link. Here’s a look at the complete project. I started by cutting out the base in some kraft cardstock. I then turned to my hopscotch papers from Close To My Heart. I used some red, white, green and brown cardstock to cut out the other elements. Here’s a closer look at the cute little cherry die cuts I created. I cut the top layer in some hopscotch patterned paper and then used some red cardstock for the bottom layers. For the accents, I used a touch of my green stickles for the leaves and for the cherries I used some pink glitter gems from Close To My Heart. I did add some foam tape underneath the leaves and under the scalloped circle die cut to give them just a bit of lift. Next I turned to my August Stamp of The Month set and stamped the frame with my Juniper Ink Pad and then followed up by stamping the sentiment with my Cranberry ink pad. For the top of the tag, I added some Pixie thick twine. Here is one last look at my completed card. Super cute and perfect for the intended recipient. Here's the Stamp of the Month set. It has a wonderful assortment of sentiments and the three labels have matching cuts with the new Cricut Artistry set. Here is the cutting file set I used from PaperCraftingWorld.com. You can snag this cutting file set for only .99 this week! And if you spend 5 (actual) bucks you can get 50% off your total purchase. That would make this file set a whopping 50 cents!!!! 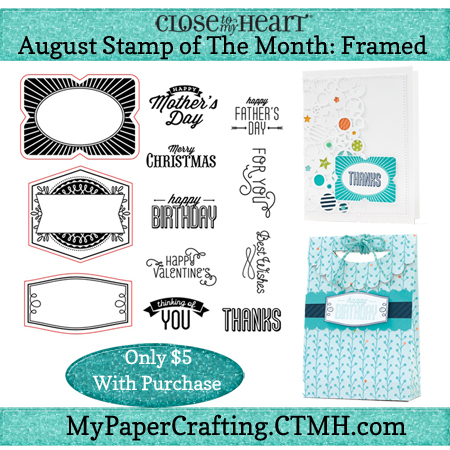 If you make any purchase from my CTMH site, I will be sharing this file with you for FREE as well as a few others for this month. You can see them all on Saturday! I just found this super fun site called Tag Your It. It is a fun challenge blog. So be sure to head over and check them out: HERE I am entering my card there as I have a fun tag on it! Such a pretty fat. Love all your colors. Thanks so much for playing along at Tag You're It. Wow such a great summery card/tag love the colors. It's such a fresh design. Thanks for joining us over at Tag You're it.